To make it as a chef in the City of Angels, a city known for its rich and diverse cuisine is not an easy task. However, 38-year-old Nicholas Shipp is quietly earning his keep among the ranks. Using a wealth of culinary experience, Shipp has brought an enticing, well-blended mix of flavors, aromas, and taste to the Santa Monica restaurant, “Upper West.” As Executive Chef, Shipp’s menu offers a discriminating palate with innovative twists to the contemporary American cuisine. Hailing from Forth Worth, Texas, the “Funkytown” native began his cooking career at the early age of 15. Nicholas worked part-time for several high-end restaurants in the greater Fort Worth/Dallas metropolis, all while playing drums in a local rock band. As his culinary skills developed and his passion for fine cuisine grew, Shipp found himself devoting more time to the kitchen and less time craving rock stardom. Finally, he found his calling and started his formal education at the Culinary Institute of Dallas. 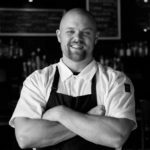 Nicholas Shipp’s passion for food has granted him the ability to assemble an expert staff that shares his vision and taste. That same passion has allowed him to create an always evolving superb menu that weathers the storm of an ever changing culinary landscape. Nicholas Shipp’s biggest supporters can be found on the home front as well in the form of his wife Ivette and children Giselle and Ethan.